Front Sight In The News > Armed defense at Front Sight: Who takes defensive handgun training? Armed defense at Front Sight: Who takes defensive handgun training? The first three series covering the Four Day Defensive Handgun Course at Front Sight Training Institute, this segment will give you an idea of who takes such courses, and whether the course is for you. You don’t have to be a perfect physical specimen with years of shooting experience to take a defensive handgun course. Our class ranged from a 28-year-old highway patrolman to older couples and, like me, a number of folks who carried a few extra pounds. 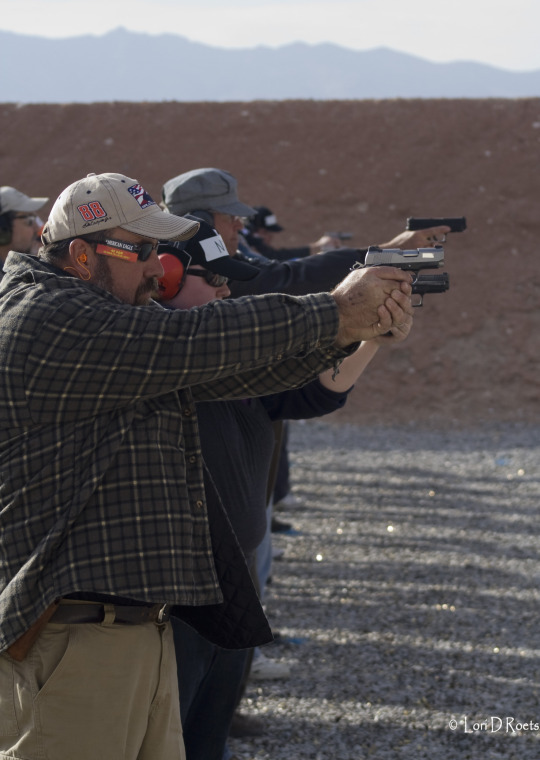 Several had little or no previous shooting experience, and instructors offer anyone who wants it the option of shooting the entire course on static rather than turning targets. Of particular interest were a couple from Australia who enjoyed America’s considerably less restrictive gun laws (both, incidentally, finished the course with “Distinguished Graduate”) and Glenn Osborne who, attending with son Derek Osborne and friend Mark Lacks, was there for “bucket list” wish fulfillment. The last day of the course began with a variety of exercises intended to cement what we had already learned, plus a segment on engaging multiple targets. Since firing controlled pairs against each of multiple opponents takes too much time, instructor Darren Hinze noted that “boarding house rules” apply: Only once all opponents have a “first course” (one round) can those who need it have “seconds.” Various tactics were discussed, particularly “stacking” opponents from moving and engaging from an oblique angle. Then it was on to the fun part: A class competition using steel silhouettes at distances between ten and about seventeen yards. Done in a single-elimination format with two students competing simultaneously, we first engaged a “hostage taker” (a steel “head” protruding from behind a hostage), and then a second silhouette at greater distance before finally dropping a yellow silhouette. The first person to clear the steel won the stage. Anyone who shot the hostage was automatically eliminated. Yours truly was on the way to victory in the final round when paired against “Bucket List” Glenn. Now the pressure was on: If I beat him, would I be denying his “bucket list” wish? If I lost, how embarrassing would it be to lose to someone with considerably less shooting experience? Suffice to say Glenn remains undefeated. Front Sight differs from some other schools in allowing students to complete a qualification course of fire for advanced certification beyond a basic certificate of completion. While strictly optional, completing the course with enough points to achieve either the “Graduate” or “Distinguished Graduate” level earns the opportunity to take advanced courses. During the wrap-up classroom session, range master Wes LaHuillier recognized those who earned Graduate and Distinguished Graduate levels, the latter of which is achieved by about ten percent of Front Sight students. I was proud to earn Distinguished Graduate with about five other students in the handgun class. The answer is “it depends.” If you haven’t taken a similar course before, it is ideal. The Four Day Defensive Handgun Course does a superb job of teaching safety, basic manual of arms, presentation from the holster, reloading, clearing malfunctions and more – all without the “drill instructor” mentality of some other schools. If you are an experienced handgunner, you might find yourself slightly under-challenged by the range work. Personally, I would have like to see some strong-hand and support-hand shooting, positional shooting (i.e. sitting, kneeling, rollover prone) and perhaps shooting while moving from behind cover. In fairness, adding elements to the course might make it too challenging for novices. Given the fact that Front Sight runs multiple simultaneous ranges, one solution might be to evaluate students’ experience when they report for the equipment check, and then assign them to a range with students of similar experience. 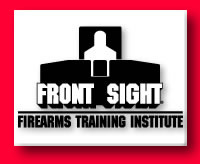 Regardless of your experience, if you keep a firearm for self-protection, you need the classroom instruction Front Sight offers on the legal, ethical and tactical aspects of using deadly force in self-defense. The classroom sessions alone are worth the price of the course. Among reasons for taking the course, let me relay the best I heard: In the classroom, I sat next to an urbane and pleasant Las Vegas couple of eastern (perhaps Indian?) descent. In one of LaHuillier’s classroom exercises, this young mother was drafted for the role of a woman loading her kids into the car when confronted by an irrational, potentially dangerous man. Would she keep distance between the threat and her children? Would she verbalize? Would she shoot the threat if necessary? We watched repeated trials as she shed her natural reticence and learned to aggressively defend her family. Later, as I talked with the couple, I remarked that they were not typical of people who considered carrying handguns for protection. What motivated them – particularly the young woman – to buy firearms and get defensive training? “Concern for my children's safety,” was her reply, and I can’t think of a better reason.